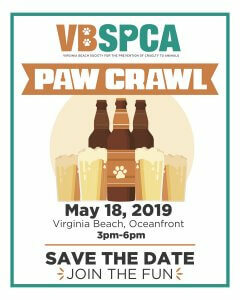 Join us on May 18th from 3-6pm for our first annual VBSCA Paw Crawl! We will be crawling to local pubs around the 31st Oceanfront corridor, all in support of homeless animals. Each participant will receive four (4) drink tickets and a commemorative VBSPCA Paw Crawl Stein! This is a dog friendly event, so bring your pup, bring your friends, and get ready to party for the animals! AND, if you wear a VBSPCA T-shirt, you will get a free raffle ticket and a chance to win one of our prizes! Where: The event kicks off at Smartmouth Pilot House at 3 pm. Participants will crawl to participating restaurants and pubs and wrap up the afternoon with a party at Murphy’s Irish Pub. Cost: $35 – The fee includes 4 drink tickets and a commemorative stein. Drink tickets can be redeemed at participating pubs, and each pub will offer a selection of beverages from which crawlers can choose. Basket Raffle: Tickets are $3 a piece, offering prizes such as a Family Photography Package, a Mutt Masquerade Party Pack, Pet Training lessons, and a VBSPCA Swag bag. Q: What is a Paw Crawl? A: The term “pub crawl” has been around for many years, inviting partygoers to go from one pub to the next stopping for one drink at each establishment. We gave it the good ole VBSPCA twist and found an animal pun to turn the Pub Crawl into a Dog Friendly Paw Crawl. Q: So, I can bring my pet? 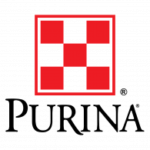 A: Yes, this is a dog friendly event and dogs are allowed on the patio at each location. Q: What if I don’t drink alcohol? A: No worries, drinking is not required. You can join in the afternoon activities and come along for the walk, conversation, and camaraderie with your fellow pet parents. Q: Does my $35 ticket include beer or drinks? A: Your ticket comes with 4 drink tickets and a commemorative VBSPCA 2019 Paw Crawl stein. The tickets can be used all at one location or you can use one at each location. It is up to you. Each location will offer a variety of beverages for which you can exchange your ticket. Q: Am I supposed to drink out of my VBSPCA stein at each bar? A: No. We will have your steins available for pickup at the last stop. This way you won’t have to carry it around with you as you crawl from location to location. Q: Do I have to tip at each bar? A: Tips for the bartenders are included in your ticket price, but they will gladly welcome additional generosity. Q: Can we bring our beer or carry cocktails from bar to bar? A: If you have a VBSPCA T-shirt – wear it! It will help us spread VBSPCA awareness and it will get you a free raffle ticket, giving you a chance to win one of our prizes. Q: May I smoke on the Paw Crawl? A: Virginia law prohibits smoking inside any public building and that includes restaurants and bars. Smokers must indulge outside in approved areas. A: No, but food is available for purchase at each location. Q: How long (distance) is your Paw Crawl? A: If you cover the entire distance of the crawl, it will add up to a total of .5 miles. Q: Does the crawl happen rain or shine? A: The crawl is scheduled on May 18th, with a rain date of May 25th. If it is postponed to the 25th, the crawl will be held on that date rain or shine. Q: I am running late for the crawl, will you wait for me? A: No worries, you can check in between 3 and 4:30 at Smartmouth Pilot House. From that point forward, you can go at your own pace. We will wrap up at Murphy’s Irish Pub and the party can continue for as long as you like. Q: Is there parking near the crawl? A: We recommend taking an uber, lyft, or taxi. If you are a designated driver for your party, there is metered parking along the streets and a parking garage on 34th street between Atlantic Avenue and Pacific Avenue. You absolutely CANNOT park in the lot on the corner of 32nd and Pacific. Q: Do I need to bring ID? A: Yes. This event is for adults ages 21 and over, and we will not be able to refund tickets if you do not bring identification. A: This is a fun, lighthearted event to raise funds and awareness for the animals. We ask that you drink responsibly and we look forward to seeing you on May 18th.